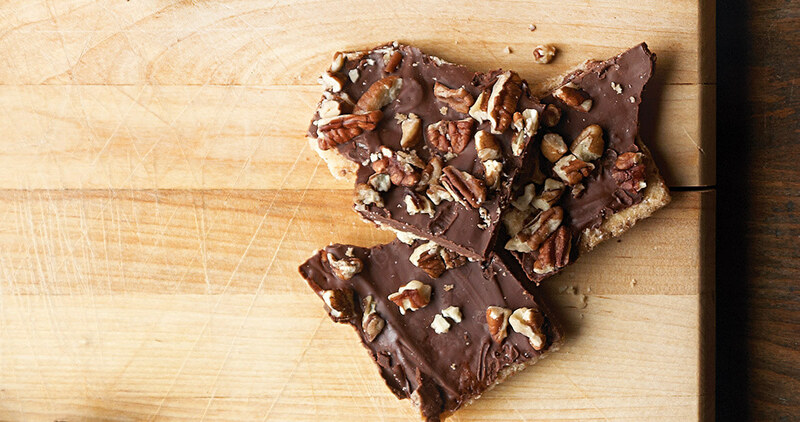 No one can believe that this irresistible toffee is quick and easy, much less made with saltines. Because the ingredients are often on hand, you can whip up a batch of this candy at the drop of a hat. It’s a great cooking project to share with children. 1. Preheat the oven to 325º. Line the bottom of a 9 x 13-inch baking pan with aluminum foil. Mist the foil with nonstick cooking spray. 2. Arrange the crackers in a single layer on the pan. 3. In a microwave-safe glass bowl, microwave the butter and brown sugar on HIGH for 3 to 4 minutes, or until sugar melts, stirring occasionally. Pour the hot butter mixture over the crackers. Hint: You can double or triple this recipe to fill a rimmed baking sheet.